In Australia alone thousands of people have an out of hospital cardiac arrest each year. Only 10% survive. It’s a very scary and dangerous rollercoaster. No better place to talk about that than under a real roller-coaster under the Sydney Harbour Bridge with Paul Middleton. Matt went to Luna Park in Sydney a few weeks back. Not to ride the roller coaster nor knock coconuts off their stands for a teddy bear, but to attend the Resus@ThePark conference. He took a few minutes to sit down outside in the sunshine with Paul Middleton the conference convenor. Of course there was hammering and drilling as some adjustments were made to the Vivid Sydney Festival set up. Which was quite fitting as Paul Middleton (@Scientosis) is building something too. A future in which anyone who has a cardiac arrest in Australia is likely to get effective bystander CPR and defibrillation. We know this stuff is important. We know that early CPR and defib makes a difference. As a former Australian Resuscitation Council (New South Wales) Chair Paul understands that this is a team sport. A big team. So now he is trying to drive change in the greater community through the charity Take Heart Australia. This means getting almost everyone in the country to realise that cardiac arrest affects everyone and that everyone has a role in helping. Everyone is a responder. We also know that even as nurses, doctors and paramedics it’s just not that easy to ‘shock’ someone, especially the first time you do it. So whats the first thing Paul needs to do to get 24 million Australians over the fear of stepping in, the fear of electrocuting people? Ask for help of course! It is no small thing trying to bring about change on a huge scale. This is a public health initiative with parallels with what Mark Wilson is trying to do with the GoodSam App. (See Jellybean 55 with Mark Wilson from SMACCdub) Mark spoke ‘via satellite’ to the audience at Luna Park. Such imaginative approaches are to be encouraged. Or would you rather sit back and wait for a government funded public health campaign to sort it all out? Nothing wrong with a grass roots movement. Resus@ThePark will be back next year. Check it out. 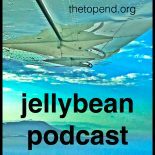 All Jellybeans are available on iTunes, Stitcher and SoundCloud. Check out the links below. This entry was posted on September 27, 2017 by Dr Doug Lynch @TheTopEnd in Uncategorized.